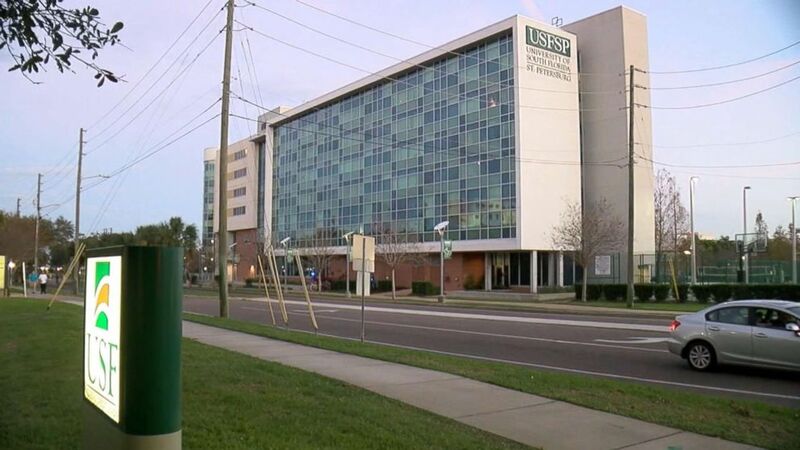 USF St. Petersburg quickly followed up, saying it was "an error in the system." The University of South Florida St. Petersburg says that it mistakenly sent 430 acceptance emails to applicants over the weekend. In a statement to ABC News, the school said that the emails were sent on Saturday and that they were a result of "human error." “All of us work in higher education because we care about students, and we understand the confusion and distress a mistake like this can cause," the school's statement said. "As soon as we found out about the situation, we immediately reviewed our process for communicating with prospective students and have changed our procedures to prevent this from happening again." (WFTS) The acceptance letter sent in error by the University of South Florida St. Petersburg. The email then goes on to provide instructions for students to find their university IDs, pay their admission deposit, apply for housing and more. 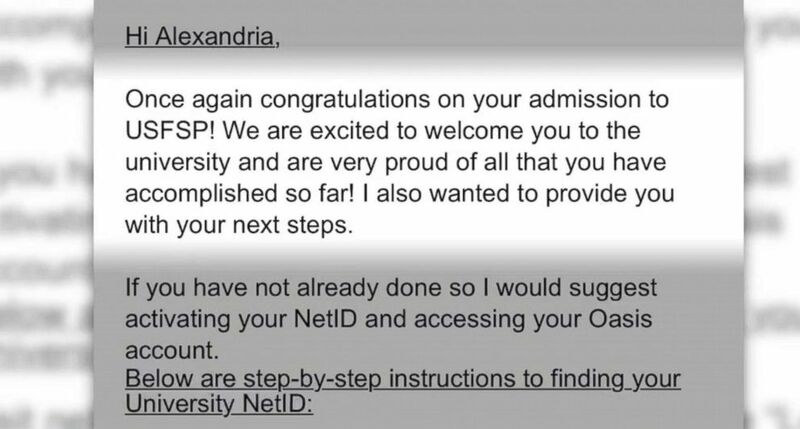 (WFTS) Alexandria Rizzotto received an acceptance letter from the University of South Florida St. Petersburg that had been sent in error. Soon after the initial email, the school sent out a follow-up email to the students that said, "There was an error in the system. Please disregard the previous email." 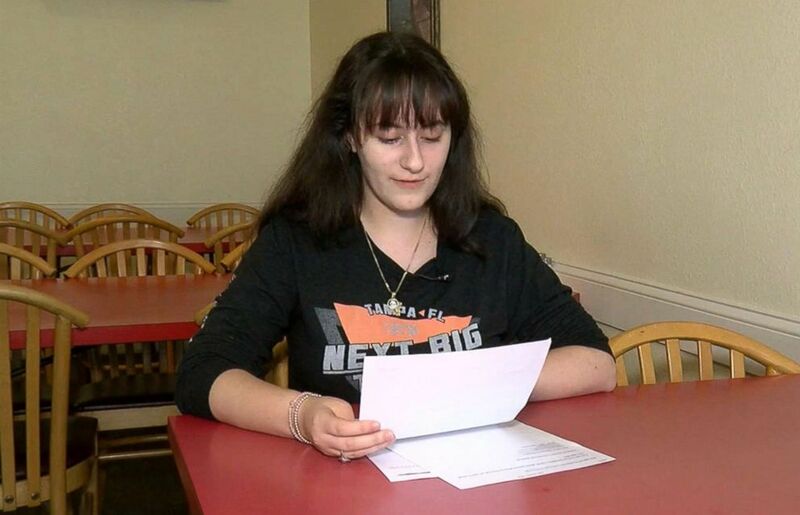 USF St. Petersburg applicant Alexandria Rizzotto told ABC affiliate WFTS that she received the acceptance email in the middle of the day Saturday, only to receive the second email nearly an hour later. "I was just so disappointed. I was very, very let down because I've been waiting for a final decision from them since November now," Rizzotto told WFTS. (WFTS) University of South Florida St. Petersburg mistakenly sent out hundreds of acceptance letters. Rizzoto also told WFTS she still hoped to be accepted to the school in the future. Carrie O’Brion, USF St. Petersburg's director of marketing and communications, told ABC News that 680 total emails were sent, of which 250 went to students that had been accepted. "The remaining 430 received the acceptance email by mistake, either because their application was still under review, was incomplete or they were not selected for admission at this time," O'Brion said. "We're calling each student who received the acceptance mistakenly to update them on their status."